While the healthy eating pyramid showed us which foods we should be eating more of, the healthy eating plate actually shows us how much we should be eating at each meal. It was very helpful dividing food into food groups and telling us to eat more of one food and less of another, but the pyramid didn’t show us how much of this food we should actually consume. The healthy eating plate addresses this. After all we eat off a plate, not a pyramid. It sets out clearly how much we should be eating at each meal by dividing a plate into different food groups. Thus fruit and vegetables should comprise half of a plate, protein a quarter, with the remaining quarter made up of grains. Copyright © 2011 Harvard University. 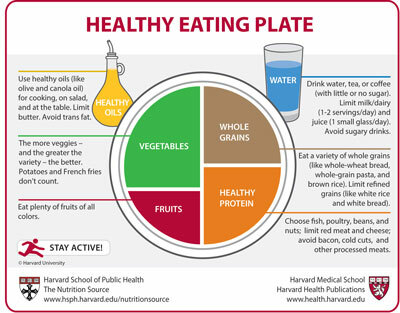 For more information about The Healthy Eating Plate, please see The Nutrition Source, Department of Nutrition, Harvard School of Public Health, http://www.thenutritionsource.org and Harvard Health Publications, health.harvard.edu. But not all proteins and grains are created equal. So here we give you some practical advice about what foods you should be putting on your plate. Fill half your plate with fruit and vegetables. These can be eaten in abundance and the more color and variety the better. Starchy vegetables such as potatoes should be eaten in moderation and I’m afraid that chips don’t count at all. Fruit, like vegetables, provides many health benefits. We should be eating a wide variety of fruits, the more colourful the better. Think of a rainbow and eat as many different colors as possible. Grains should comprise a quarter of your plate, but not just any grains. There are two types of grains, whole grains and refined grains. What is the difference between whole grains and refined grains? Whole grains contain the entire grain kernel, while refined grains have been milled removing much of the fiber, iron and vitamins. Because they are less processed, whole grains provide essential nutrients vital for good health, reducing the risk of heart disease, diabetes and cancer. So what whole grains should we be eating? Whole-wheat flour, bulgur (cracked wheat), oatmeal, whole cornmeal and brown rice are much better options than say white bread and white rice. Proteins fill the remaining portion of the plate and include foods such as meat, fish, chicken, eggs, beans and nuts. Again choose which proteins you eat carefully. After all a hamburger cooked in fat is protein, but is not healthy. So it’s not only important to choose lean cuts of meat, but how we cook it is just as important. Fried chicken or fried eggs are going to contain large amounts of saturated fat. Not good. Red meat should be limited to several times per week only. Chicken - Buy skinless chicken or remove the skin before cooking. Processed meats such as sausage, frankfurters and deli meats have high levels of sodium and can be high in saturated fat. Lean luncheon meats such as lean turkey, roast beef, ham or low-fat luncheon meats are a better option that bologna or salami. Beans, peas and nuts are also included in this group as they are excellent sources of plant protein containing nutrients such as iron and zinc. Because of their high nutrient content, peas and beans should become a regular part of everyone’s diet, not just vegans or vegetarians. But we’re not talking about green peas or green beans here. We are referring to kidney, pinto, black or lima beans, black-eyed peas, garbanzo beans (chickpeas), split peas and lentils. Use healthy plant based oils such as olive oil and canola oil in your cooking and on salads. Drink water, coffee or tea and leave out the sugary drinks. Even fruit juices can have high levels of sugar. It goes without saying that alcohol should be drunk in moderation. What we drink is just as important as what we eat, as sugary drinks are simply empty calories. Dairy, and that includes milk, should be limited to two servings per day and always choose the low-fat or fat-free version. A high dairy intake can increase the risk of some diseases. The little man running across the bottom reminds us of the importance of exercise. After all we can’t achieve a healthy lifestyle if we remain sedentary.